The New York Times columnist Maureen Dowd has called Jackie Kennedy (Pictured above in Waterford, Ireland in 1967) a ‘Geisha girl’ and agrees with her that the Irish have a persecution complex. 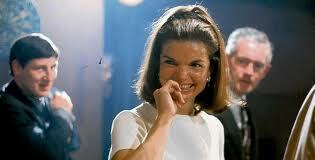 Irish American Dowd says that Jackie was a deeply compliant wife who “was a Geisha” who prided herself on it. Interviewer Arthur Schlesinger asked was that like being a compliant Japanese wife Jackie Kennedy responded, “Yeah which I think is the best”. Don’t expect Dowd to be breaking out a Dinty Moore can of Irish stew anytime soon either. After Jackie O had stated that she was glad to replace Irish stew in the White House kitchen with sophisticated French cuisine Dowd agrees. She also agrees with Kennedy saying that the Irish have a persecution complex. She also says Kennedy clearly ignored her husband’s womanizing.